View of Jupiter’s south pole created using data from NASA’s Juno spacecraft. Astronomers finally know how old Jupiter is. The gas giant's core had already grown to be 20 times more massive than Earth just 1 million years after the sun formed, a new study suggests. About 4.6 billion years ago, the solar system coalesced from an enormous cloud of gas and dust. The sun formed first, and the planets then accreted from the leftover material spinning around the newborn star in a vast disc. Theoretical work strongly suggests that Jupiter took shape quite early in the solar system's history, but the planet's precise age had remained a mystery, Kruijer and his colleagues said. Jupiter is not only the largest planet in our solar system, but it’s also the oldest, according to a new study. This work indicated that the meteorites came from two distinct "reservoirs" that were spatially separate for 2 million to 3 million years, beginning about 1 million years after the solar system formed, the researchers said. 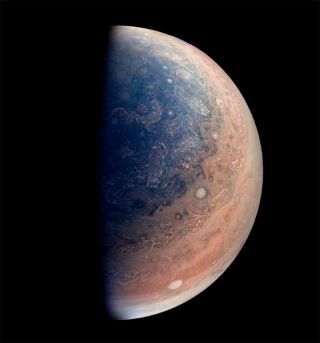 "The most plausible mechanism for this efficient separation is the formation of Jupiter, opening a gap in the disk and preventing the exchange of material between the two reservoirs," the researchers wrote in the new study, which was published online today (June 12) in the journal Proceedings of the National Academy of Sciences. Jupiter's core would have to be about 20 times more massive than Earth to keep the two reservoirs from mixing, Kruijer and his team calculated. So, the results suggest the nascent gas giant was already that big within the first 1 million years of solar system history, the researchers said. "Our measurements show that the growth of Jupiter can be dated using the distinct genetic heritage and formation times of meteorites," Kruijer said in the same statement. The new study could also help explain why the solar system lacks worlds intermediate in mass between Earth and "ice giants" such as Uranus and Neptune. Such "super-Earths" are relatively common in other star systems. "One important implication of this result is that, because Jupiter acted as a barrier against inward transport of solids across the disk, the inner solar system remained relatively mass deficient, possibly explaining its lack of any 'super-Earths,'" the researchers wrote in the new study. April Full Moon 2019: The 'Pink Moon' Rises Tonight!